Ex 32: 30 ¶ And it came to pass on the morrow, that Moses said unto the people, Ye have sinned a great sin: and now I will go up unto the LORD; peradventure I shall make an atonement for your sin. Php 4:3 And I intreat thee also, true yokefellow, help those women which laboured with me in the gospel, with Clement also, and with other my fellow labourers, whose names are in the book of life. Rev3:5 He that overcometh, the same shall be clothed in white raiment; and I will not blot out his name out of the book of life, but I will confess his name before my Father, and before his angels. We see here true ministry, leaders who recognize that what they do holds eternal consequence. Moses, when he rebuked the people, and they came to him, approached God, willing to die, eternally, on behalf of the people God gave into his care, in sacrificial, eternal love. God heard him, and received his prayer, and spared his life, both temporally, and eternally, with His reply: v33 And the LORD said unto Moses, Whosoever hath sinned against me, him will I blot out of my book. So the apostle Paul recognized the same, as sacrificial servants worked with him in the gospel, he spoke by revelation of an actual event that he understood to have occurred in the heavenlies, their names were written in the book of life, a very real book, before the throne of God, that keeps eternal record of who might enter heaven, and what their reward might be, forever. 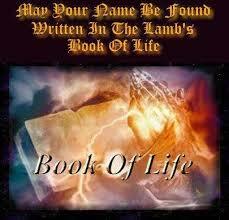 Is your name written in the the book of life? Have you not only received Jesus as your Lord and Savior, but do you serve Him? Have you made Him your Lord, or merely pay lip service to a dead church, full of dead traditions and rituals, void of the presence of God in His holiness, and power? Prayer to the One True God is always powerful. Amen!